Rohit scored a fifty in Auckland. 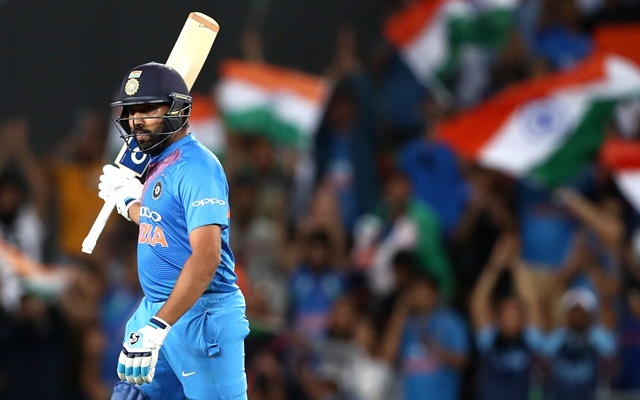 Rohit Sharma has arguably been one of the greatest limited-overs cricketers India have ever dished out. He made his international debut against Ireland and has carved himself a reputation as a dependable batsman in white-ball cricket. Earlier, the Nagpur-born used to play reckless strokes and give his wicket away, but with time he has matured to a significant extent. Sharma is currently playing the three-match T20I series against New Zealand. He is also the captain of the national team as Virat Kohli, their all-format captain has been rested after he captained India to an unassailable 3-0 lead in the ODI series, which the visiting team won 4-1. Even last year, Rohit led from the front and guided his team to victory in a couple of series. Moreover, one also can’t doubt Rohit’s prowess as a batsman. In the ongoing series, the 32-year-old became the leading run scorer for India in T20I cricket. He currently has 2288 runs in 92 matches at an average of 32.68 with as many as four centuries to his name, the most for any cricketer. He surpassed New Zealand veteran Martin Guptill, who has 2272 runs in 76 games. Rohit opened the batting when the visitors were chasing 159 in their 20 overs. He failed in the first match at the Westpac Stadium in Wellington but didn’t flatter to deceive by any stretch of the imagination. The right-hander notched 50 runs from 29 deliveries and his knock was laced with three boundaries and four hits into the stands. He stitched together a stand of 79 runs from 56 balls and put his team in a position of command. He would be proud to enter the elite list of leading run-scorer. 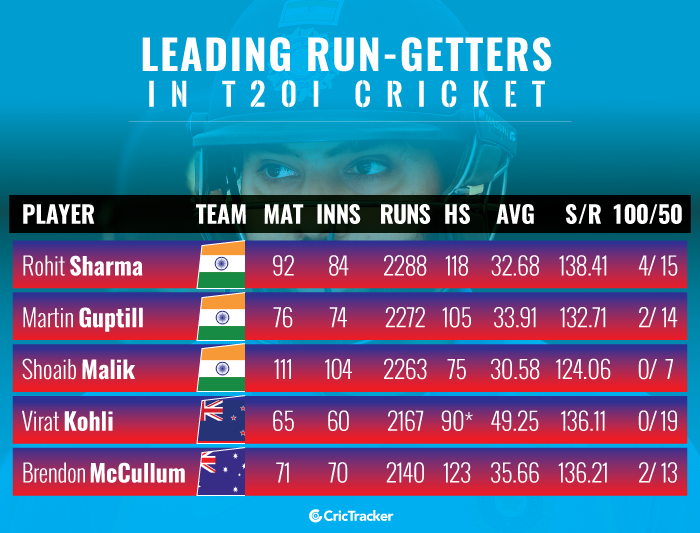 The list also has Kohli, who hasn’t played much T20 cricket off late. Brendon McCullum and Shoaib Malik are the other players in the list.